In previous versions of Windows, disabling startup programs helps your system boot much faster. You can still do it in Windows 8.1 too, and it’s easy. In previous versions of Windows, you can help it start up faster by disabling startup programs with Task Manager. You can still do it in Windows 8.1, but the process is different. 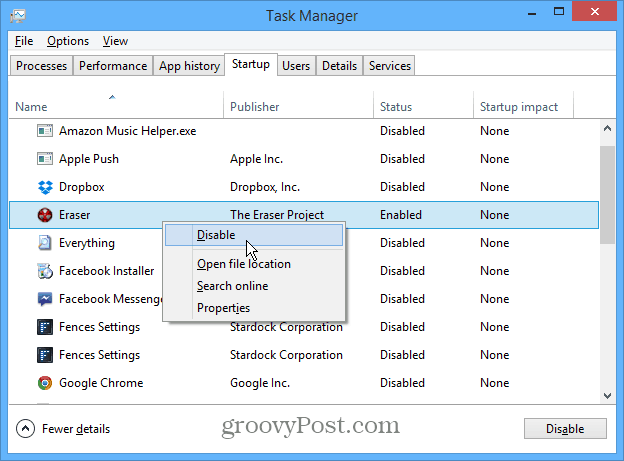 Task Manager has been revamped since the days of Windows 7, and disabling startup programs is easier, plus more information about the apps and programs is provided. While Windows 8.x does boot noticeably faster than Windows 7 and earlier, you can make it boot even faster by disabling startup programs. 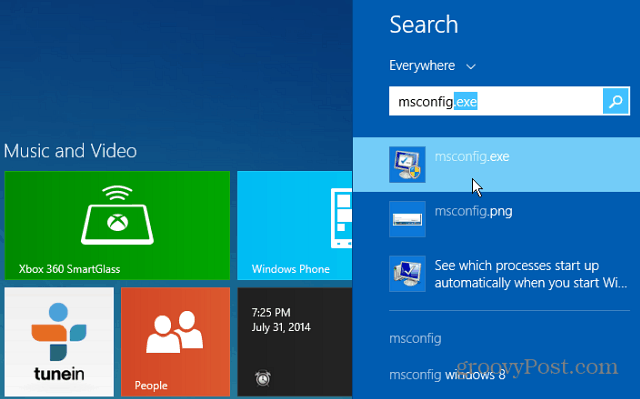 1 – From the Modern Start screen type: MSConfig and hit Enter. 2 – Or from the desktop, just like Windows 7, right-click the Taskbar and select Task Manager. Either way, you do it, the new Task Manger will open on the desktop. Click the Startup tab to see the items set to run when you boot your system. Right-click on any of the programs to and click Disable. 3 – Click the Startup tab to see the items set to run when you boot your system. Right-click on any of the programs to and click Disable. The program will still appear on the list, but the Status will change to Disabled. Right-click an app again and select Enable to have it run during startup. Notice that when you right-click a program in under the Startup tab, you’ll see more options. This allows you to get a better understanding of what each program is or does before you disable it. I find the option to search for the program online to be particularly beneficial. We’re all guilty of installing desktop programs or apps, using them once, and after a year you have no clue what they are. For more details, check out our guide on new features available in the Windows 8.x Startup tab in Task Manager. As ever, all of your tips are great! Thanks for reading Alan! We’ll continue to bring everyone the best we can! As a side note it really bugs me that Windows NT 6.2 was called Windows 7, Microsoft should have either increased the internal version to 7.0 or called it Windows Vista R2 to mirror what they did with Server 2008’s upgrade being called Server 2008 R2. This is my favorite because if a program is misbehaving and somehow prevents the mouse or keyboard from working you can use this shortcut to switch away from the program and use Task Manager to kill it. If even Task Manager can’t open then you can shutdown or restart the computer from the CTRL+ALT+DEL menu as that shortcut key is reserved by Windows and no running program can override it. 2. If you move your move to the bottom left of the Windows 8 taskbar and right click you get a menu of tools to select including Task Manager. 3. You can pin Task Manager to the Windows 8 Start Screen. 4. You can pin Task Manager to the Taskbar. The ability to pin things to the Taskbar was added with Windows NT 6.1 but you could add shortcuts to the Quick Launch toolbar in previous versions. In Windows 95 and Windows NT 4.0 you got the Quick Launch via installing Internet Explorer or the Windows Desktop Update patch. Windows 98/98SE/ME and Windows NT 5.x bundled Internet Explorer so they got features like Quick Launch built-in. It is possible to rip out Internet Explorer from Windows 98, 98SE, ME, 2000 and XP but you lose many features like Quick Launch and the ability to surf the internet without another web browser installed. How do we ADD programs to the startup list? @disqus_sCieidrNJ4:disqus another option is to try the “Startup” Folder. You can also just type “shell:startup” (or “shell:common startup”) at the Start screen to get to the user (or all users) Startup folder. Thank you, Dallen. After mucking about with msconfig and task manager and all the other approaches suggested online, accessing the Task Scheduler and setting up a basic task to open Outlook upon startup was indeed the simplest solution. I’m not a stupid person, nor am I a computer noob; I maintain all of my family’s pcs, updating them over the years, even taking apart my own desktop and notebook pcs to repair and upgrade them. I purely hate how Windows 8 has made formerly simple functions needlessly complicated. If I wanted a damned touch screen tablet I’d buy one, and then maybe–though I doubt it–Windows 8 might make more sense. As it is, on my newest Dell notebook without a touch screen, it’s nothing but aggravation. Slap a program in there Win 8.1 and I think 8 also. It’s a pity Microsoft have removed the option from the msconfig program as Task Manager does NOT list all the individual programs which can get started on startup. If you’re looking for where some rogue program is getting started from, Task Manager may not help you – there are at least 5 places (probably more) in the registry that can start programs; msconfig used to list them all, TM seems to filter them somehow. In my opinion the new TM is a backward step giving you less information. No, you need to give us more info. Please! When I go to the Startup tab in Task Manager, and it lists Cyberlink Virtual Drive and Cyberlink DVD and another five apps, I see they are all enabled. I knew that. But it didn’t help. When you select the app to disable, you right click it, and the selections come up to disable, open file location, search online and properties, disable is in light grey though the other three are in dark black. It won’t do disable or even tell me why! So deciding I can use other software for videos, I’m now trying to delete Cyberlink, but in the list of programs in Control Panel it doesn’t show Cyberlink Virtual Drive at all, just four other Cyberlinks. Lol. This is crazy. I loved windows 7 where I could do all the disabling. So I uninstalled Cyberlink DVD Player but that just did that one; the other three are still showing up in the Control Panel and the Virtual Drive still shows up in Task Mgr Startup. Microsoft reminds me of JC Penney right before it went bankrupt. On yeah, that hasn’t happened quite yet. JCP started catering to their lowest common denominator, the kids who don’t have jobs and little money, but made their store a cool place for the young to hang out. Microsoft, you’re next. Too bad, nobody made a product (at one time) as good as yours. Oh well, you’ll find out soon enough that your strategy of building a flashy operating system (Win 8) while stripping out parts of windows we’ve all come to appreciate will relegate your crappy software to the trash heap. I can disable n enable it, but i can’t open the file location and propeties. And it have no icon..
Great article, but it does not help with stuff like Norton internet security for instance. the trial ran out with new computer, I thought I would just remove from startup and leave it on so I could try something else for a bit to see which I liked better since you get a better deal if you use the renew from your computer. But it does not load it’s components through the startup folder. It is also impossible to kill using the task manager. It always comes back. I found a couple of services running and disabled starting there but not sure that will do it as I have to reboot. Has anyone used CCleaner by Piriform on their Win 8 machine? It’s pretty effective with Win 7.
msconfig.exe does not work any more for disabling the start up programs in windows 8. @Vivek: If you open it via the Modern UI, Click the Startup tab in System Configuration and click the “Open Task Manager” link. Then you will see the Startup programs. If you open it via the desktop, you don’t need to do that extra step. Really?, well where did all the programs that were listed in misconfig’s start-up tab in every prior version of windows go? Mine only shows 4 programs starting up, and I know for a fact there are several times that many programs loading up at start-up… I can no longer control what my computer loads up since microsoft has hidden or removed every possible way to get to the list like it was in every prior version of windows…. Completely LAME. FAIL. Does anyone know how to get to the start-up list as it was in every prior version of windows? I want to speed up my computer and shut off 2/3rds of the programs loading. You can use the Sysinternals Autoruns program. It shows you what’s on startup gathered from many sources (even more than msconfig) and lets you enable/disable them. Sysinternals was bought by Microsoft a few years ago and the free download is on Microsoft’s TechNet site. Oh why oh why change something when it’s not broke…. microsoft.. I am very glade to be here on your best site. I hope you allow me to ask for extra information with this topic after I follow yours but still get problem or wondering some points on How To Disable Windows 8.1 Startup Programs. thank you from Fred Welch. I think I disabled the wrong program in the start up now I have a blank screen. You have to log in as an administrator to be able to disable some start up items. There are loads of articles about how to log on as an administrator. My family have been faithful paying passengers on the good ship Microsoft Windows. However,the Captain has left the ship, and the crew appears unable to fathom the waters. I think Windows10 might become your last chance to keep us on board! Thnx for the FYI — We’ve talked a lot about CCLeaner over the years here at gPost however Total Privacy 5 is something I’ve not played with. Will take a look. I can disable the offending programs (Gtbrmon64, 64brmon64 & 5kbrmon64) all left after removing a game from Gamingworld, owned by Mindspark. But I cannot find or remove them yet, even when hidden files are shown. No money to buy an app, a free one if possible to find & remove these files PLEASE, anyone? Mindspark is NO help whatsoever. They just refer me to the same worthless help pages. I’d to find others interested in starting a class-action lawsuit against Mindspark. Is there a way to stop autostarting of a special program for a non-privilegied user? Problem is: My (non-password) wife disturbed by computer asking for _my_ password after startup. But how to remove it ? Helpful. Thank you for these very clear instructions. Thanks a lot for your invaluable help. quick and efficient solution- thank you! i need help please, i have windows 8.1 installed. Now when i switch my computer on, it says: preparing automatic repair. the whole day nothing happened, it gave me options to refresh or restore stuff, etc Can anyone help please. Cheers, I needed this because of Chromium making my computer slow.